Private Event at Cedar Bloom Farm! The land will be closed to Hipcamp and AirBnB these dates. For more information on booking your event with us, visit our events page! at Cedar Bloom, Cave Junction Oregon. 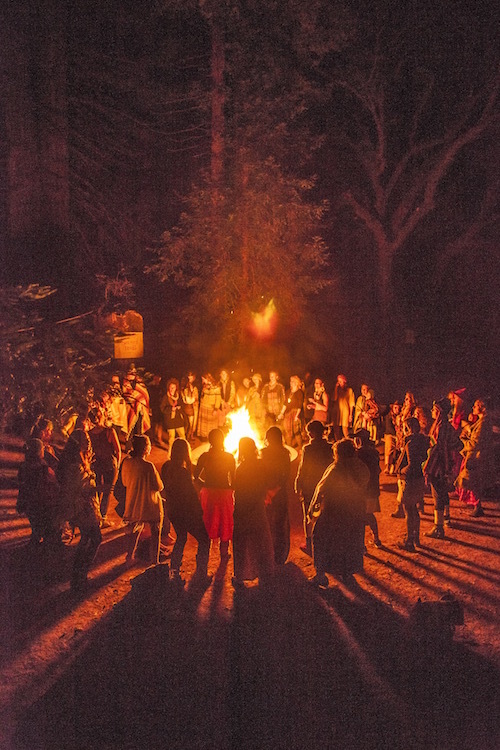 Spirit Weavers Gathering is a five day celebration of cultures past and present, a remembering and practicing of basic human skills to ensure the survival of the body and the soul. Fermenting foods, weaving, dying fabrics, creating ceremony, sharing meals at night and dreams in the morning, the making of plant medicines- singing songs, together as a community- these were the common knowledge ways and part of the simple pleasures of a life lived in balance and harmony with nature. Let us gather together as Women and share our skills in remembrance of the beauty path and an honoring of our Ancestors. Tickets for the 7th Annual Spirit Weavers Gathering go on sale JANUARY 12TH 2019 at 10AM PAC TIME. You can learn more about this event by visiting the SPIRIT WEAVERS GATHERING website. Cedar Bloom will be closed to the public during the Gathering. Join us for an immersion in the healing power of Nature. Topics include identifying and healing cultural obstacles to wholeness, utilizing body symptoms as messengers for healing, redeeming the Sacred Masculine & The Sacred Feminine out of patriarchy, re-framing the epidemic of despair and more. Lots of herbal medicine will be interspersed with spiritual teachings including discussion of common conditions and tips on formulating. Classes will go into the evenings to allow time for integration, informal sharing & swimming during the heat of the afternoon. Carpool is encouraged. To offer or request carpooling, call Dr. Frances. Update: Camping is now included in the cost of the class ($115 value). Camping includes two bathhouses with multiple showers, sauna, full outdoor-kitchen on 100 acres of paradise on the Illinois River. View the Event flyer here. Please share with folks who may be interested! Cedar Bloom will be closed to the public during these dates. 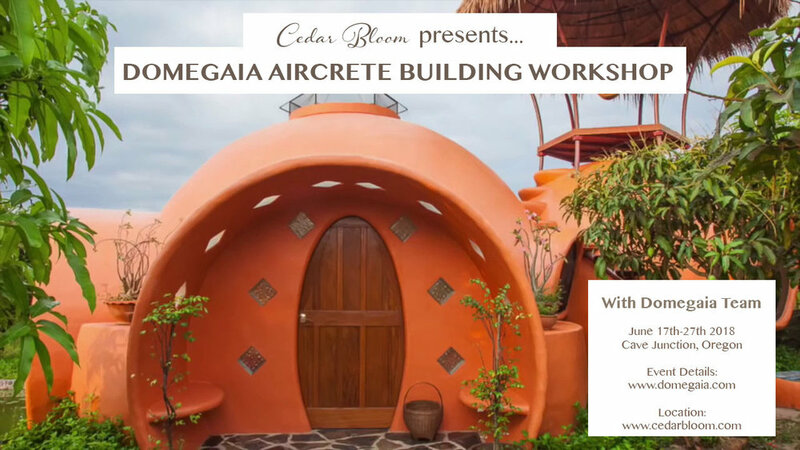 During a 10-day workshop, you'll deepen your connection to your creative spirit while learning the fine art of AirCrete Architecture. Have the time of your life with new friends from around the world. This is your chance to learn how to build your own AirCrete dome home with your own hands from scratch. Domegaia workshops usually include time for yoga, guided meditations, dance, music, and exploring local attractions! Make new friends from around the world, learning, laughing, and building together. These drawings include 12 pages detailing the layout and measurements, including floor plan, perspective, elevation and section drawings ith all the basic dimensions. Information about foundation, plumbing and electrical details are also shown. We believe that everyone has a basic right to create quality housing for themselves. And we're dedicated to help you do that. This is your opportunity to learn how to build a beautiful, low-cost dome home from master-builder Hajjar Gibran. Once you feel the harmonic geometry inside a Domegaia dome, you'll know you've come home. If you've ever dreamed of building your own home, mortgage-free, then this workshop is for you. Join us and learn how to build a dome home! **To Register for this workshop, please visit the domegaia website After you are registered, you will need to purchase your accommodation and meals through us, by using the links below. Choose your own Dome building experience! The cost of accommodation is for June 17-27th and includes all meals, and access to all campground amenities. Accommodation: We have 4 different camping options to choose from. See below to register and choose your accommodation preference. Meals: Breakfast, lunch, and dinner will be shared together, and served in an open-air dining area surrounded by the forest in which we gather. ur Kitchen Magicians will be providing organic vegetarian meals. This workshop is limited to 35 participants. More than 4 weeks prior to the first day of workshop - 100% refund, minus a $100 processing fee. 2-4 weeks prior to start day of workshop - 50% refund. Less than 2 weeks prior to start day of workshop - no refund. If the workshop is cancelled, you will receive an immediate full refund. Cedar Bloom will be closed to the public during the Domegaia workshop. The 6th Annual Spirit Weavers Gathering is sold out. You can learn more about this event, and add your name to the waitlist, by visiting the SPIRIT WEAVERS GATHERING website.